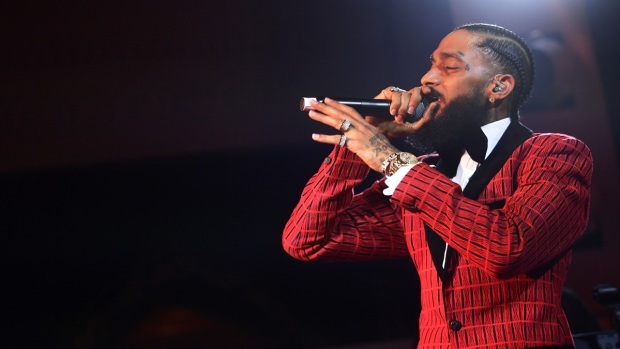 Rapper Nipsey Hussle was shot and killed outside his clothing store in the Hyde Park neighborhood of South Los Angeles Sunday, while two other people were also injured. The shooting occurred at approximately 3:20 p.m. in the 3400 block of Slauson Avenue, Mike Lopez of the Los Angeles Police Department said. Lopez said that it was an ongoing investigation, no one had been detained and the suspect or suspects remained at large. The shooting took place outside the Marathon Clothing Company, a clothing store owned by the Grammy-nominated rapper whose real name is Ermias Asghedom. Asghedom was one of the three people shot, and he died at California Hospital Medical Center, sources told NBC4. Sources said at least one suspect fled the scene in a vehicle, but no suspect description was immediately available. The killing capped a violent week in South Los Angeles featuring 30 shootings, with at least 17 people struck by gunfire. The rapper was a regular at Staples Center, and LeBron James of the Los Angeles Lakers joined a collection of athletes and entertainers taking to social media to pay respects to the late rapper. Hundreds of people gathered at the site of the shooting as news spread. Mourners included Matthew Talley, a Denver engineer and director known as Megatron. "It ain't just Los Angeles. He was an inspiration that was bigger than Los Angeles," Talley said. "You see all these people out here? "He was really cool. He was a dope individual every time I met him." Some mourners remained in the parking lot early Monday morning. The area around Crenshaw Boulevard and Slauson Avenue was expected to undergo street closures as police investigated the fatal shooting, the LAPD said. LA Mayor Eric Garcetti said his Crisis Response Team was assisting the families coping with shock and grief. He called the shooting an "awful tragedy." 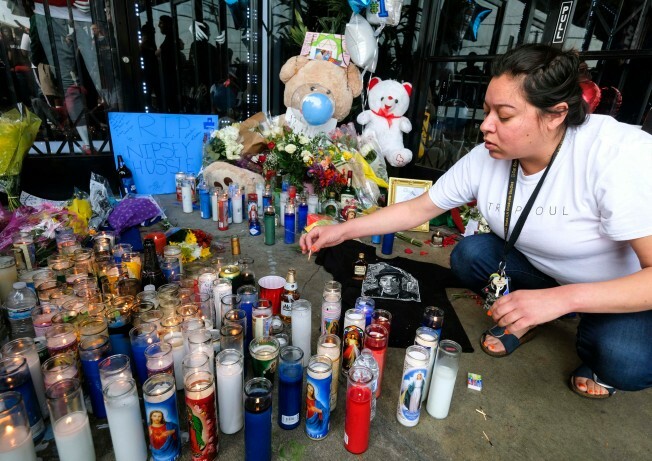 Supervisor Mark Ridley-Thomas, who represents South LA on the Board of Supervisors, said in a statement, "Ermias Asghedom, known to us as the hip-hop artist Nipsey Hussle, was a father, businessman, entertainer, and inspiration to many. We mourn his sudden and tragic passing and send his family our deepest condolences." Ridley-Thomas urged calm and a period of reflection, warning against violent retaliation. LA Police Commissioner Steve Soboroff took to Twitter to express his sadness and share that he and LAPD Chief Michel Moore were, at the request of the rapper, scheduled to meet with Roc Nation on Monday to talk about ways Hussle "could help stop gang violence and help us (Moore and Soboroff) help kids." In a 2010 interview with "Complex" magazine, Hussle discussed his past association with the Rollin 60s Neighborhood Crips, a Los Angeles street gang. More recently, he participated in community development efforts and was part of the team behind Destination Crenshaw, an open-air museum honoring African-American achievement. "I think that with me being influential as an artist and young and coming from the inner city, it makes sense for me to be one of the people that's waving that flag," he told the LA Times last year. He also invested in Vector 90, a program in South LA for young people interested in science, technology and mathematics. Hussle called it a bridge between Silicon Valley and the inner city. Hussle's debut studio album "Victory Lap" was nominated for a Grammy in the Best Rap Album of the year category.